The Cambridge Concert Orchestra has been making music, and making it fun, since 1967. 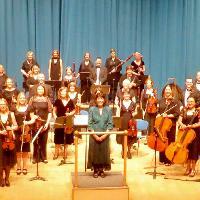 We have a reputation for being one of the friendliest orchestras in Cambridge and enjoy playing a wide repertoire of music. The orchestra is very privileged in having its own extensive library of sheet music, much of it donated to the orchestra by Charles Shadwell (formerly of the BBC Variety Orchestra). We are also proud to have commissioned new pieces by contemporary composers. This means that every concert is different and there is always something for everyone. While the orchestra&apos;s emphasis is on enjoyment, our concerts also serve to raise money for local, national and international charities. Please contact us if you think that the orchestra could collaborate with you for a fundraising event. As well as performing in large venues (e.g. West Road Concert Hall in Cambridge or The Apex in Bury St Edmunds), we really enjoy taking our music directly into the community by playing to smaller audiences in churches, community centres, fêtes etc. in and around Cambridge, as it is important to us that as many people as possible have the opportunity to hear live music.